Key difference: Cookies and Biscuits are mostly favorite sweets of all. In texture, cookies are heavy and rough and full of nuts, oats, raisins and chocolate chips; while biscuits are slightly soft, crispy and thick and are full of sugar and butter. Cookies and Biscuits are baked soft and hard type of breads, generally preferred in the form of snakes. There is not much huge difference between a cookie and a biscuit, as there preparation technique is one and the same, both are baked products; they only differ in their ingredients, i.e. cookies consists of heavy and more stuff ingredients as compared to that of the biscuits, which are only sweet baked butter breads. 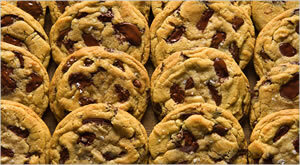 Cookies are soft sweet biscuits, which are made with lavishing nuts, oats, resins and chocolate chips. These ingredients add a fabulous flavor in the taste of cookies. There are varieties of cookies, available in various parts of the world. Generally, cookies are favorites among the kids and school children. The whopping amounts of sugar in American cookies are responsible both for the crispiness and the chewiness. Biscuits are hard sweet baked bread, which are especially full of sugar and butter. There are sugar free fibrous types of biscuits available in the market, for the ones who are either diabetic or sugar patients. Biscuits are also prepared same as that of the cookies, only differs in their content, i.e. 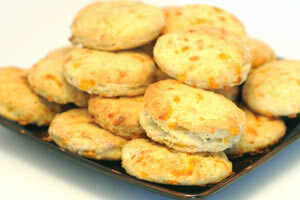 biscuits are full of the basic ingredients, which are butter and sugar. There is not much stuffing obtained in biscuits as observed in the cookies. They are available in flavors and types. Both, cookies and biscuits mean the same, while the difference lies in the places where they are known differently, i.e. the word ‘cookies’ is often referred to biscuits and cookies in the American countries, whereas the term, ‘biscuits’ is generally used is in the British countries. A cookie is a small, flat, baked treat, usually containing flour, eggs, sugar, and either butter or cooking oil, and often including ingredients such as raisins, oats, or chocolate chip in the United States and Canada’s. A biscuit is a small baked product that would be called either a "cookie" or a "cracker" in the United States and sometimes a "cookie" in North America and the Commonwealth Nations and Europe. Dutch word koekje or (informal) koekie which means little cake. Middle French word bescuit is derived from the Latin words bis (twice) and coquere, coctus (to cook, cooked), and, hence, means "twice-cooked". They contain more sugar than Biscuits. They contain a proper and standard calorie amount of sugar. A cookie is an American English name. A biscuit is a British English name. Cookies because of the stuffs are little heavy and dense than Biscuits. Biscuits are much lighter and fluffier than Cookies. There are stuffing’s like chocolate chips, resins, oats and nuts here. There are only the basic ingredients, such as the sugar and butter. Cookies may be accompanied by ice cream, a glass of milk and chocolate dessert. Biscuit may be accompanied by jam, butter or cheeses on the table to spread on it.